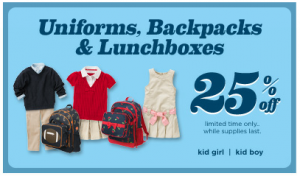 Back to School Clothing Deals: The Children’s Place, Gymboree, and more! It seems like summer just started and already the Back to School clothing sales are starting! To make the most of your back to school shopping, make sure you are registered for a cash back site! Ebates.com – Choose between a $10 gift card for Barnes & Noble, Target, Home Depot, and more or a $5 cash back bonus after your first purchase of $25 or more. ShopAtHome.com – Get a $5 cash back bonus after your first purchase! Children’s Place – All uniform items are marked down 25% Plus, you can save an addition 25% off your total purchase with the code HOME72 and ShopAtHome.com is offering 10% cash back right now, too! Crazy 8 – Save 25% on all uniforms and backpacks! They are also having their semi-annual sale. Prices start at $3.99. 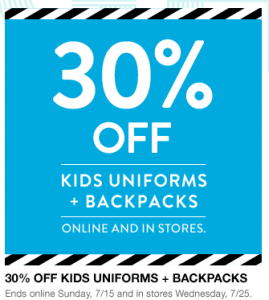 Gap – Save 30% on all uniforms and backpacks in stores and online. Save 30% off all sale items or 25% off regular-priced items when you enter the code GAPHAPPY at check-out. (valid through 7/12) Get free shipping when you spend $50 or more. You can also get 2% cash back from Ebates or 3% cash back from ShopAtHome.com. 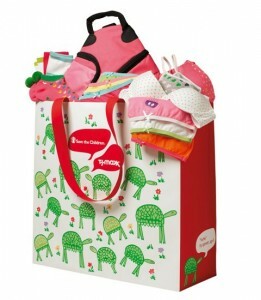 Gymboree – Save 25% on all uniforms, lunchboxes and backpacks. They are also having their Big Red Balloon sale! Save up to 70% off regular retail prices! Old Navy – Save 20% off your total online purchase when you enter the code ONSAVE20 at check-out. Sadly, this excludes uniforms and everyday steals. Get 6% cash back from Ebates and up to 7% cash back from ShopAtHome.com. Back to School Clothing Deals Round-up: Gap, JC Penney, The Children’s Place + more! There have been LOTS of great deals on back to school clothing today! Here’s a round up so you don’t miss out!